Only 15 minutes into its fundraiser, McCracken Middle School’s photography class, which is a part of the school’s YES (Year End Studies) program, had already sold 12 original photographs to raise money for HUB-BUB’s Artists-in-Residence (AiR) program. The class teaches students about digital photography while letting them explore the Cultural District of Downtown Spartanburg taking photographs. During the semester, students also learn about other forms of art while visiting the Spartanburg Art Museum at Chapman Cultural Center. By the end of the semester, each student had a complete photography portfolio and sold their original pieces to fundraise for AiR. AiR, which has served the Spartanburg County community for 10 years, offers two studio artists an 11-month residency, which includes a monthly stipend, studio space and housing with paid utilities. Each artist-in-residence provides 15 – 20 hours of artistic community service every week, serving projects like the Sparkle City Mini Putt course. Our 2018 – 2019 artist will host open studio hours at the Chapman Cultural Center’s new Creative Placemaking Studios, located on the first floor next to the ticket office. Be on the lookout for the announcement of our two new artist-in-residence later this month! Former HUB-BUB AiR, Robin Schwartzman, and her public art project, Sparkle City Mini Putt, was highlighted in a feature-length documentary call Through the Windmill. From New York to California, Texas to Michigan, artists working in a variety of mediums have relocated to Spartanburg for the duration of the residency. Originally an 11-month program for 4 artists (3 visual artists and a writer) the new program will host 2 visual artists from September 2018 through August 2019. After being welcomed into the Spartanburg community, a handful of artists-in-residence decide to stay in Spartanburg after completing their residency. Jennifer Bonner (2014), Patrick Whitfill (2008), and Eric Kocher (2011) are a few of the artists currently living in Spartanburg. Each artist-in-residence has provided approximately 15 – 20 hours each week of service to the Spartanburg community. This service has been in the form of community engagement projects that intersect with their creative practice. One notable project is the Sparkle City Mini Putt course, located just behind the Fr8yard on Broad St., which was designed by 2014 AiR Robin Schwartzman. All of our artists have, in some form or another, collaborated with other organizations, businesses, and individuals in our community. From the Spartanburg Humane Society to the Spartanburg Area Conservancy, each artist has used their unique insights and interests to strengthen partnerships in our community. The two artists selected to participate in this year’s program will host open studio hours at the Chapman Cultural Center’s new Creative Placemaking Studios, located on the first floor next to the ticket office. This space will be renovated this summer and open to the public beginning in September when our artists arrive. We’ll be announcing our selections by the end of June! We received so many applications from wonderfully talented and brilliant artists this year, which means that our selection committee has their work cut out for them. Stay tuned for our announcement in June to find out about the artists we’ve selected to participate! Donate today to support artist residencies in Spartanburg! The newest public art project in Spartanburg seeks to give the county’s seven colleges more of a presence downtown. 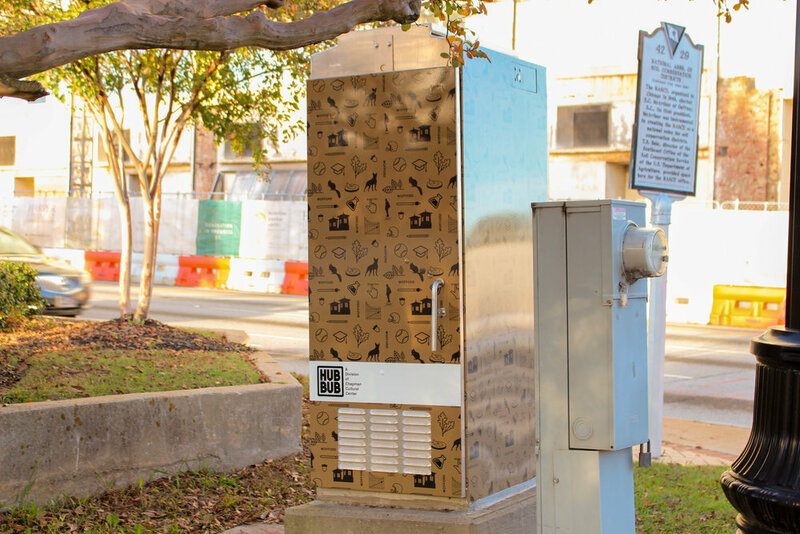 Electric Art, an effort by Hub-Bub and the College Town consortium, features colorful vinyl coverings on nine utility boxes across the city. 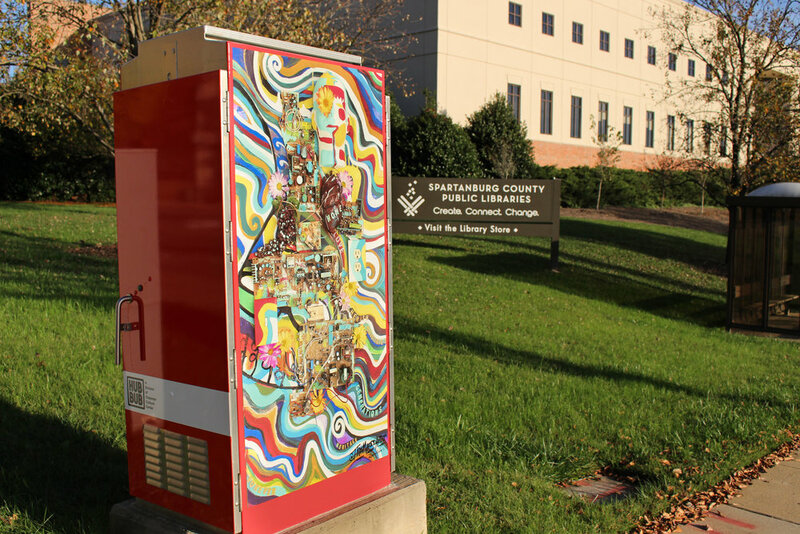 Each of the county’s seven colleges and College Town are featured on boxes, and the work of Roderice Cardell, also known as the Maddd Artist, is in front of the Spartanburg County Headquarters Library. Sam Veremchuck, a Wofford College graduate and outreach administrator at the Chapman Cultural Center, surveyed students at several of the county’s colleges to learn what icons should be included with each college’s colors and design. He worked with local artists Russell Bannan and Eli Blasko to design each college’s vinyl pieces. That led to lesser-known things being included on the vinyl box covers — like strawberries and cream, a Converse College tradition dating back to the college’s beginning, being included on its box, just in front of Groucho’s at Church and Main. Monday afternoon, the boxes featuring Converse, the Edward Via College of Osteopathic Medicine, Spartanburg Methodist College and College Town were all complete. Boxes for the University of South Carolina Upstate, Wofford, Sherman College of Chiropractic and Spartanburg Community College were left to finish. Kocher said the most difficult part of the project was getting approval for the designs from the S.C. Department of Transportation. 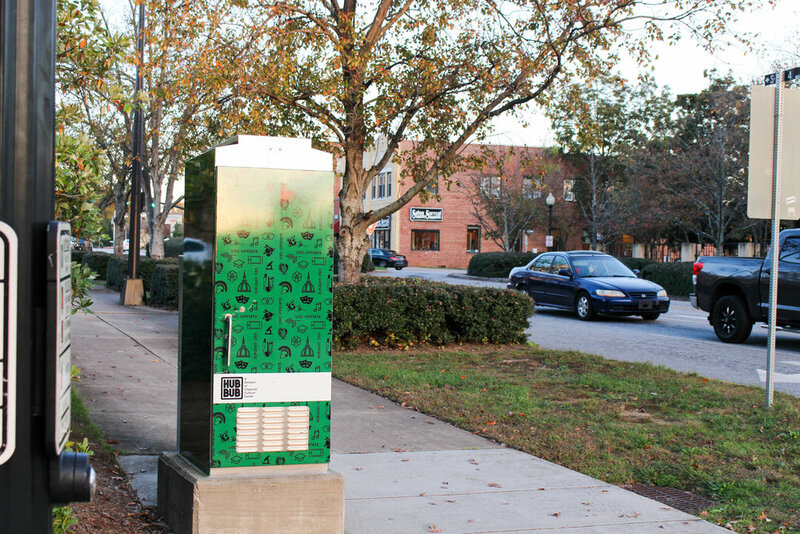 SCDOT owns the utility boxes, so any changes have to receive approval in Columbia, he said. The newly redesigned boxes add to the ongoing gradual facelift across downtown. Electric Art started because it would add more art to structures that were either meant to be ignored or had been overrun with graffiti, scratches and faded stickers, Kocher said. A group of Spartanburg artists and creatives formed in 2004 soon will be under the umbrella of Chapman Cultural Center. 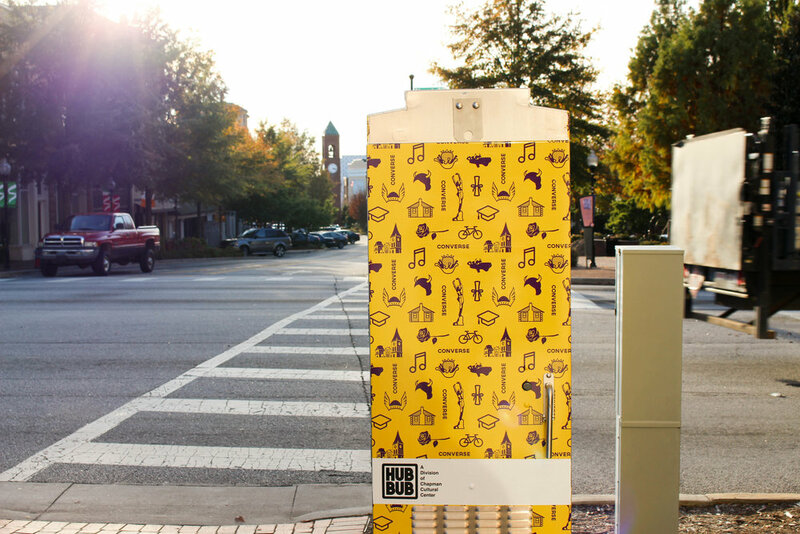 This summer, Hub-Bub will become part of Chapman Cultural Center’s Outreach and Community Development Division, which manages the Spartanburg Downtown Cultural District and various neighborhood public arts programs. Jennifer Evins, CEO and president of Chapman Cultural Center, said the merger is a good business move that will be able to leverage the center’s capacity as a leading arts agency with Hub-Bub’s strengths as a creative manager of public spaces. Evins said Chapman Cultural Center intends to build upon Hub-Bub’s offerings and programs to benefit area artists and Spartanburg’s economy. Hub-Bub’s showroom gallery and performance hall was located at 149 S. Daniel Morgan Ave. from 2006 until 2015. The showroom provided a space for the group’s events and a venue for artists to present their work. Since moving out of the building, Hub-Bub has occupied a space off of Spring Street. This past summer, Hub-Bub launched a variety of new downtown programming with plans to bring up to 150 free, public events each year for the next three years to Morgan Square. Eric Kocher, managing director of Hub-Bub, said the group is excited about the upcoming union with Chapman Cultural Center. Kocher said the merger will help expand Hub-Bub’s inventory of public art and provide new events and opportunities to spend time in downtown Spartanburg. 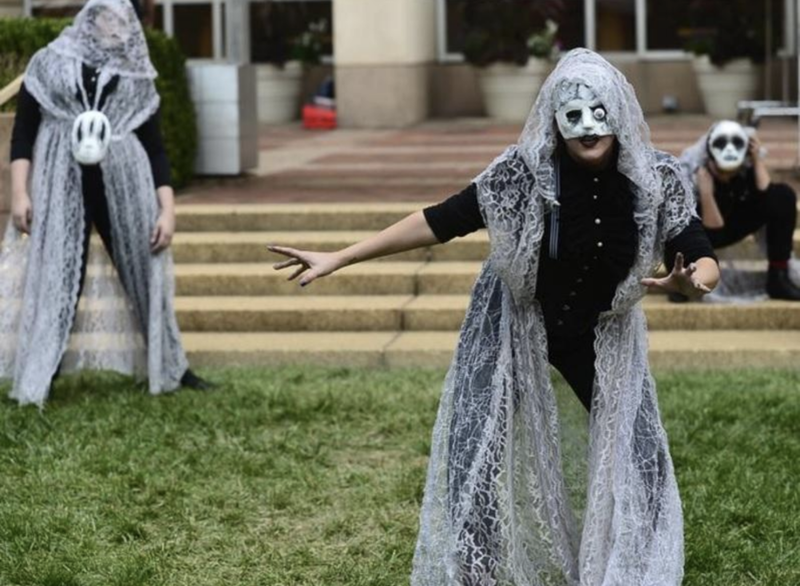 “We also look forward to re-imagining and expanding our artists-in-residence program, through which we will recruit talented artists and creative professionals from around the country to live and work in Spartanburg,” he said. This December we will host an outdoor holiday market on Wall Street for local artisans, artists, and makers. With space for over 25 vendors we are set to add to downtown's holiday festivities with a unique shopping experience that fulfills our mission of encouraging local involvement. The event will span two days: Saturday, December 10th and Sunday, December 11th. If you are interested in applying to become a vendor check out this helpful guide and then head over to our application to submit your business. We would love to accommodate all interested parties, but with limited space we need to take applications to ensure a varied market. In addition to retail there will be drinks, light food, and live entertainment at specific times. We hope that this starts a tradition that can carry on for many years to come. Spread the word and join us for the holiday market this December 10th and 11th!